It has a decent reach with a large surface area. It is an useful product without the mesh you’ll see in other models. It offers the convenience of both a light and rechargeable battery. The common house fly, Musca domestica, has annoyed humans and animals for ages. But it’s more than just the nuisance of them buzzing around you and occasionally biting you. Flies carry life-threatening diseases including typhoid fever, anthrax, and tuberculosis. And if that weren’t enough, their bites pose a risk of spreading infection because of the places they typically occupy like sewers, animal quarters, and garbage. If you have a problem with flies, we sympathize with you. 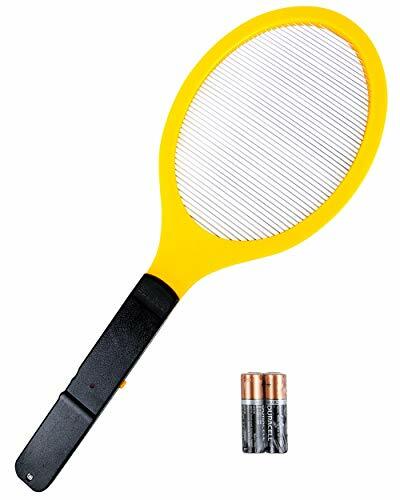 Our Top 4 Best Electric Fly Swatters 2019 review will arm you with the products you need to get rid of these pests so that you can enjoy your home or yard again. Keep reading to learn more about your options. How Do Electric Fly Swatters Work? How Can I Prevent a Problem with Flies? It has a 100-percent satisfaction guarantee. It has an indicator light so that you know it’s is ready to use. The design and operation will discourage its use by children. It’s spendy for what it is. You can get it in large or standard sizes. Its dimensions are 18.9 x 7.1 x 1 inches. 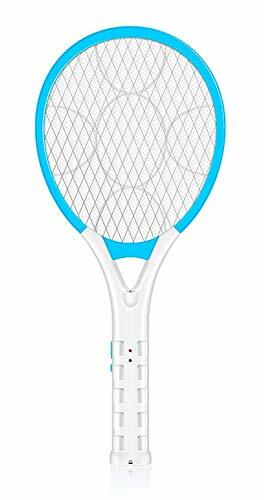 The Elucto Large Electric Bug Zapper is a handy device for swatting flies on the go. It is sturdy and well-made. It has a layered design to prevent accidental zaps. The package includes the two AA batteries which we appreciated. We’re happy to say that the product works as described. It has a comfortable hand feel to it, making it a breeze to use. It includes a full one-year warranty. It is well-made to last. It works on larger bugs. The product description claims it’s not a toy, but the branding says something else. There is some confusion about whether there are batteries with it. It measures 20.08 x 7.09 x 1.18 inches. The Sourcing4U Limited The Executioner is similar to the previous product. It has the same power source but a little longer and a bit lighter. It even has a similar warning LED to indicate that it’s ready to use. It has several warning statements which are common sense. It lacks the mesh that you’ll see in many electric fly swatters that some users may prefer. You can charge it with a USB connection. It has a triple-layer safety mesh to protect you against accidental zaps. It has a larger surface area. It includes a one-year, satisfaction-guarantee warranty. The shock delivers 3,000 volts. The dimensions are 17.99 x 1.42 x 6.81 inches. 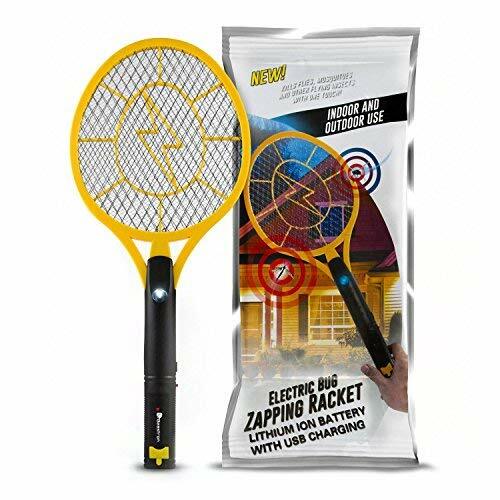 The Beastron Bug Zapper Racket offers a larger area for killing pests along with the convenience of the ability to recharge it. It even includes the lithium battery. It lacks the LED warning indicator of the two previous product, but it has a light that more than makes up for it. It charges quickly and gets a lot of use. It’s slightly heavier, but you won’t notice the extra weight. It holds a charge for up to 10 days. It includes a 30-day satisfaction guarantee. It is durable and well-made. It isn’t as effective on larger insects. You can buy it in either small or medium sizes. It measures 17.5 x 9 x 0.9 inches. The AOWOTO Plu- In Electric Rechargeable Bug Zapper has the features of more expensive models at an affordable price. It has a built-in plug which makes recharging it convenient. The charge is a bit less at a maximum of 2,200 volts, yet it gets the job done, albeit, with smaller bugs. It has an optional light that you can switch on if you prefer too. It also has “intelligence electricity” to avoid shocking people. They kill flies and other insects by delivering a jolt of power that varies with the item. Now that you know the kinds of products available let’s get into the details about how these fly swatters work and what you can expect. We’ll wrap up with some information about how to prevent a problem with these pests because everyone hates flies. The operative word with these products is zapper. They kill flies and other insects by delivering a jolt of power that varies with the item. If you hit them, you will get rid of them instantly. When looking for one, make sure to check on the power source. Some manufacturers include the batteries. It’s a factor in the overall cost of using an electric fly swatter. You’ll also see rechargeable ones too which certainly adds to their overall value. The jolt the fly swatter delivers depends on the power behind it. The more that it has, the bigger the bug it can kill. These products will work as described. You’ll notice common themes with them, but they work on the same principle of a quick kill. Pay attention to the size of the surface area since it can help improve your aim if it’s larger. Most are about the size of a badminton racket with a truncated shaft. They are lightweight and easy to grip. These are often selling points that a manufacturer will tout. You’ll find products with alternating positive and negatively charged wires. Some also include one or more layers of mesh to protect the user. Therein lies the rub. Some think that the latter option makes it harder to kill the bugs because it acts as an additional barrier. However, there exists a risk of getting shocked yourself without it. We prefer the ones with mesh, especially if there are children in your household. 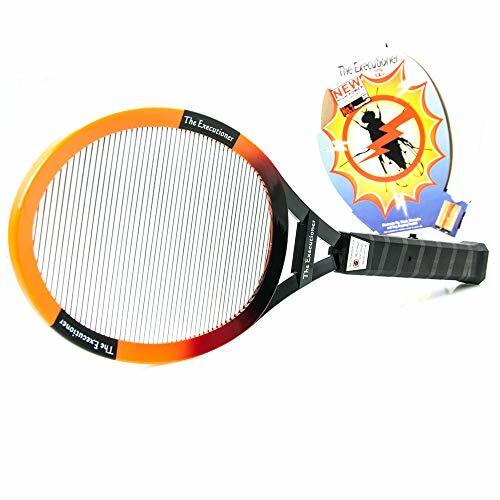 Electric fly swatters offer a non-toxic solution to an annoying problem. That point alone makes them worth a look. Your alternatives are repellents or insecticides, both of which have disadvantages. The other thing to remember is the type of pest. You won’t deter deer or horse flies with a bug spray, even one with DEET in it. They won’t respond to it. Your only choice is to kill them. These products get the job done without having to use pesticides in your home. Some individuals might consider them fun to use too. They certainly make light of a vexing problem which we can appreciate. One could even make a case that offers a way to get in some exercise and perhaps even stress relief from taking the issue into your own hands. They are a novelty, but they also work. Unfortunately, flies are most active at the temperatures that are most pleasant, usually between 68 and 77℉. And the times when they’re not buzzing you are over 113℉ or below 50℉. It’s hard to avoid them since they share our preferences for the ideal conditions to be outdoors. You may not get rid of them entirely. However, you’ll go a long way in preventing an infestation if you keep your yard clean. We’d also suggest removing any sources of standing water which can provide habitat for their development. And remember, It’s far easier to prevent an issue than to eliminate one. Bear in mind that some kinds of flies make this task all but impossible. Horse and deer flies are particularly tenacious. For these pests, avoidance is your best course of action. If you must go outdoors, wear a hat with a long-sleeved shirt and pants for optimal protection. On a positive note, they don’t usually go indoors, preferring the outdoor environment instead. You’ll also need other products for ongoing control of a fly issue and to keep an existing one from getting out of hand. Repellents, traps, or sticky strip are useful ways to maintain a pest-free home. Flies are a fact of life. The best course of action is to use these other methods in addition to keeping your backyard well-maintained with a minimal amount of fly habitat.